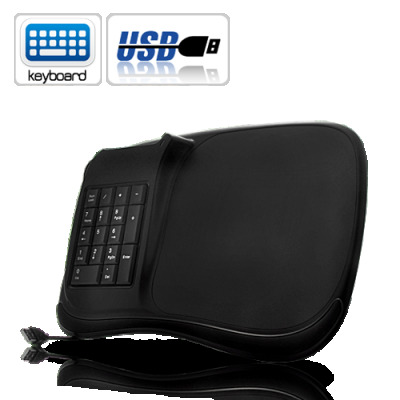 Successfully Added 3-in-1 Numeric Keyboard Mouse Pad with 3-Port USB Hub to your Shopping Cart. This cool and practical 3-in-1 Numeric Keyboard Mouse Pad with 3-Port USB Hub brings you extra convenience while using your computer. This 3-in-1 Numeric Keyboard Mouse Pad with 3-Port USB Hub comes with a complete numeric keypad, a mouse pad and three USB ports that are compatible with all current USB devices. Its ergonomic design brings additional comfort and precision for operating the mouse, and allows you to connect more USB devices to your computer or laptop. It’s an easy to use, plug-and-play gadget that uses with your computer or laptop directly without installation of any software. It is suitable for accountants, business people who deal with numbers a lot, people who are looking to add more USB devices to their computer, or people who are not comfortable with using the touchpad on their laptops. Offered at a friction of the price if sold separately, this 3-in-1 Numeric Keyboard Mouse Pad with 3-Port USB Hub is now in stock for immediate shipment worldwide. Order yours today and get it within just a few days. Brought to you by your source for latest cool gadgets, Chinavasion. Plug and play. No software or drivers necessary.